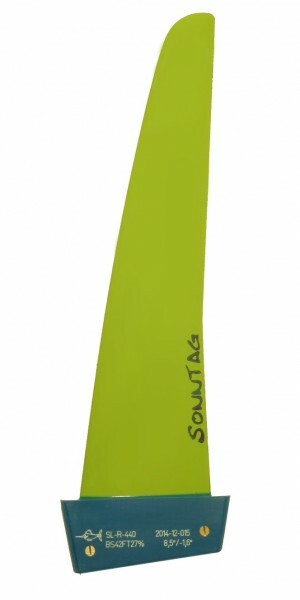 A new fin designed for Slalom Racing. Tested and used in PWA and national slalom competitions. Going in rough conditions, doing the best speed possible downwind and performing fast and controllable jibes are the most remarkable characteristics of the new SL-R. The fin’s physical design requires the construction with high-end carbon types like IMS65 and TeXtreme. These materials are the base for long-term performance and soft but durable fins. The profile was developed for low drag over a wide range of AoA with robust flow and delayed stalling. The unique outline in combination with the developed carbon lay-up creates a very rugged base2mid section and a more flexible mid2tip section for controlled bending and just a bit twist keeping the control in critical conditions. We adjusted the profiles, profile depth, outline, thickness distributions and of course the carbon lay-ups for usage in the three typical slalom board sizes S, M and L. This means that a SL-R of 38 cm length out of the S-mold is different in the above mentioned parameter than a 38 cm SL-R out of the M- or L-mold. We produce in length, rake and stiffness as requested by our customer. Available in length of 30 to 51cm in Tuttle and DT. A detailed surface area chart can be found in the “About fins” section.